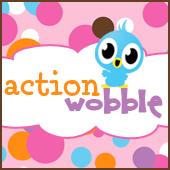 Action Wobbles: Have a Good Time! Melisa from Melisa's Crafty Creations here with you this morning. Today is my last day as an Action Wobble Design Team Member. I had a great time being on this Design Team. This card was inspired by the song Good Time by Alan Jackson. You can see the video here on YouTube. Check out the video, it's a great song. The card base is from Pretty Paper, Pretty Ribbons Sunburst Shapes Cutting File. The road is from the Home Sweet Home Cutting File. The car is from the Are we there yet Cutting File, also from Pretty Paper, Pretty Ribbons. The sentiment is from My Creative Time's Fright Night. Here goes the car wobbling down the road.